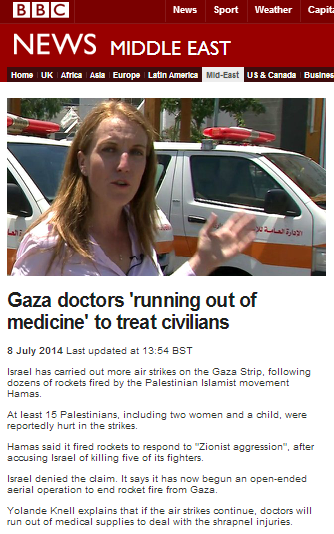 Perhaps the only vaguely surprising thing about Yolande Knell’s promotion of the tried and trusted theme of a shortage of medical supplies in Gaza in her July 8th filmed report for BBC television news was the fact that she did not wait longer than a few hours after Operation Protective Edge commenced before producing it. The report was also publicised on the BBC News website’s Middle East page under the title “Gaza doctors ‘running out of medicine’ to treat civilians” and the same topic was also promoted in another report by Knell for BBC television news. Now of course any reasonable viewer would conclude from Knell’s portrayal of the situation that the shortage of medical supplies is caused by those “tight border restrictions” she makes sure to mention. However, as was documented here in November 2012 when the very same theme was promoted by another BBC reporter at the very same hospital – that is not the case. Firstly, the claim that medical supplies are affected by restrictions on dual-use goods (which can also be used for purposes of terrorism) into the Gaza Strip is a complete fabrication. There is not – and never has been – any restriction on the entry of medical supplies to the Gaza Strip. The actual causes for the permanent and already existing shortage of medical supplies in the Gaza Strip are explained here. “The long-standing shortage of medicines and medical supplies in Gaza emanates primarily from a dysfunctional relationship between the Palestinian Ministries of Health in Gaza and Ramallah. The conflicts between the two offices have resulted not only in a shortage of medicines and supplies, but also in restricted access to medical treatment for patients outside of Gaza. The healthcare system in Gaza is marked by a shortage of 400-500 varieties of medical equipment and an average shortage of 33% of desired types of drugs at any given time. The situation is further exacerbated by the fact that medical suppliers are often reluctant to sell supplies to Gaza due to issues of non-payment. Notably, that same theme of a shortage of medical supplies is being promoted in other Western media sources too; a fact which of course should have prompted Yolande Knell to do some more serious fact checking before she repeated the information she was given by staff at a Hamas-linked hospital. And what of Knell’s other topic – a shortage of fuel? Well, as has frequently been documented here in the past, that problem too is due to Fatah-Hamas infighting and has absolutely nothing to do with “tight border restrictions”. Clearly millions of BBC viewers and website visitors have been misled by this report by Yolande Knell. A prominent public correction is therefore in order.